Offhours is the best thing that ever happened to your at-home wardrobe. 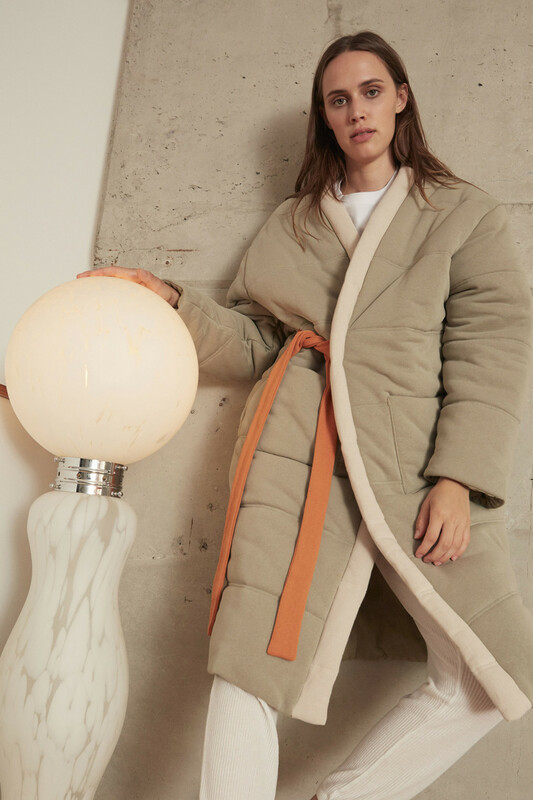 We’ve lost track of how many times we’ve fantasized about turning our down comforters into a wearable article of clothing. Seriously, shouldn’t there be something that lessens the blow of unraveling yourself from your nest of blankets in the morning? 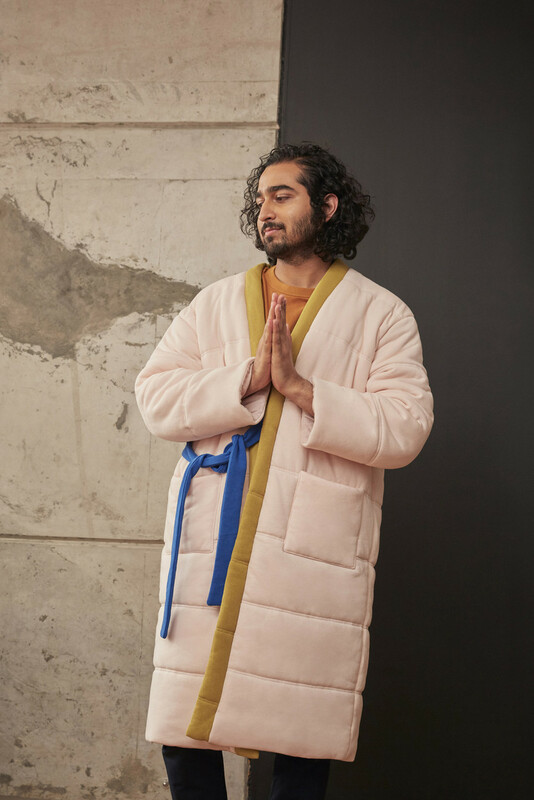 Well, say no more, because Offhours founders Rebecca Zhou and David McGillivray have not only heard our pleas for nonstop coziness, but transformed them into a chic, contemporary closet staple known as the Homecoat. Prepare for maximum comfort. 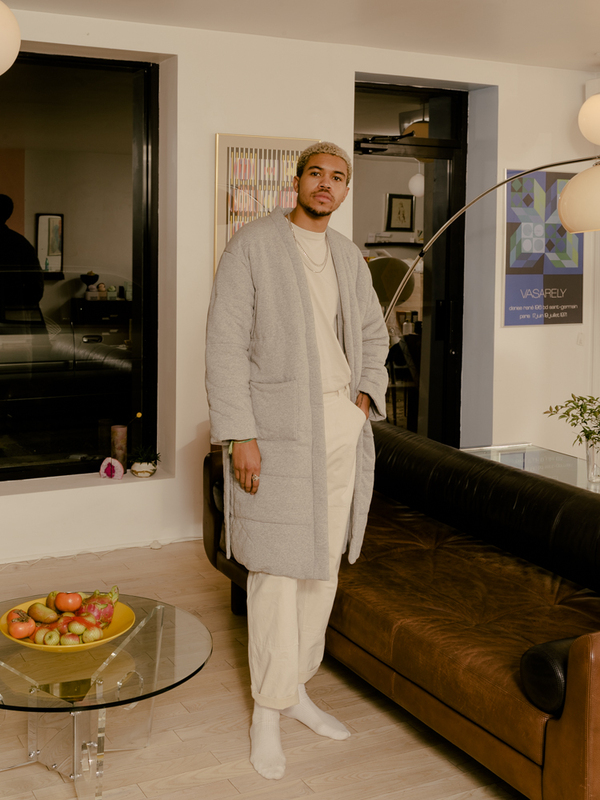 The husband-and-wife team—whose respective backgrounds in design and brand consulting span companies like AYR, Glossier, and Diane von Furstenberg—didn’t initially set out to create what they have dubbed “inactive wear.” “When I was trying to search for pajamas, I saw a lot of stuff that were beautiful silk nightgowns or robes,” says Zhou of the brand’s origin, “but to me, they felt very much like something I would wear on my honeymoon, not every day.” This lack of innovation in the space between practical and high-end loungewear is what initially sparked the idea for Offhours. As Zhou explains, “We decided to start with one unique product that really represented the idea of what Offhours is—super comfortable, but never compromised on design.” The result is the Homecoat, which happily delivers on this promised combination of comfort and style. With a 100-percent cotton french terry exterior, and a t-shirt fabric poly-cotton blend lining the inside, the coat keeps you warm without weighing you down. It’s slightly oversized, yet structured, with five different gender-neutral colorways that range from a sweatshirt-inspired grey to a barely-there blush. Just looking at it induces the urge to squeeze the wearer, so don’t be surprised if you find yourself receiving more hugs than usual if you wear it to host your next dinner party. Zhou elaborates, “The home is a place where you’re with your loved ones—your partner, your roommate, your children, your pet, or you’re inviting your friends over. It’s a space for you to really be yourself. When customers get home, they’re able to change out of their outside clothes, and all of a sudden, they’re in a different mental state. It’s very intentional for them to feel more in control than [when] you’re just getting bumped around by outside forces.” We can only hope that more brands take as much care with our emotional and physical well-being in the future. Until then, we’ll be purchasing ourselves (and a friend) a Homecoat and staying inside until spring.